Looking for a good basic hunting rifle, complete with optic? This Savage Special is hard to beat. Right now you can buy a Savage Hunter XP Model 11 (short action) or Model 111 (long action) for just $449.99 complete with 3-9x40mm Bushnell scope. 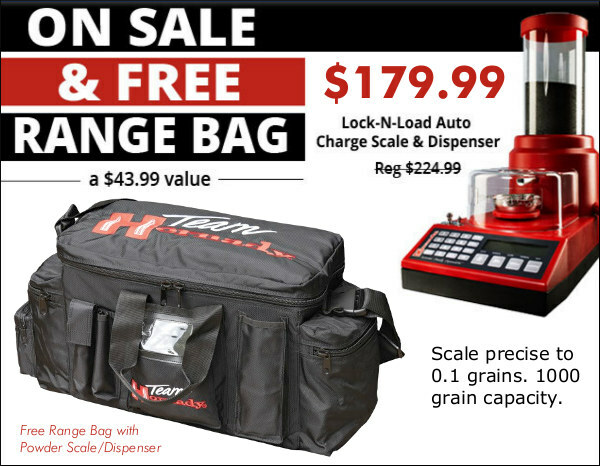 But it gets even better — Savage Arms is offering a $100.00 Mail-In Rebate that lowers your net cost to a mere $349.99. 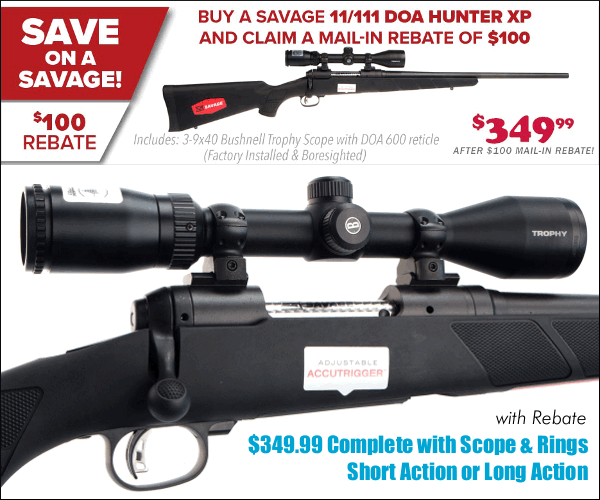 That’s right — get Savage hunting rig, complete with scope, in your choice of 15 chamberings, for just $349.99. 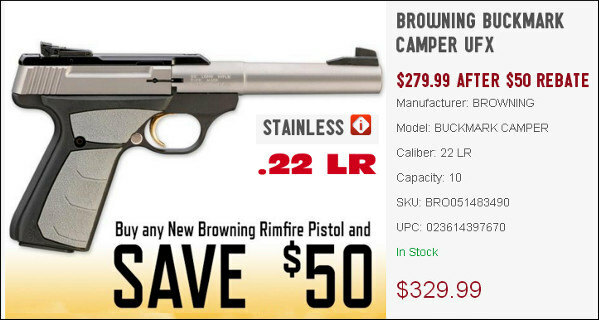 Bullets, brass, powder, optics, dies, tools, stocks, barrels, actions — all this and more is on sale at Bruno Shooters Supply right now. 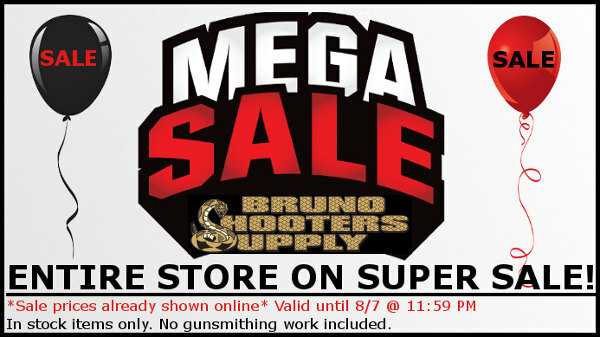 You’ll find savings on pretty much everything Bruno’s sells (except MAP-price items). But you have to act quickly. This storewide sale ends TODAY, August 7th at 11:59 PM. You snooze, you loose. NOTE: You don’t need a special discount code — the sale prices are already shown online, good for today (8/7/2017) only. EuroOptic is moving to a larger facility. To ease the transition, EuroOptic needs to reduce its large Sightron Optics inventory. Accordingly, Sightrons are marked down with very large price reductions. 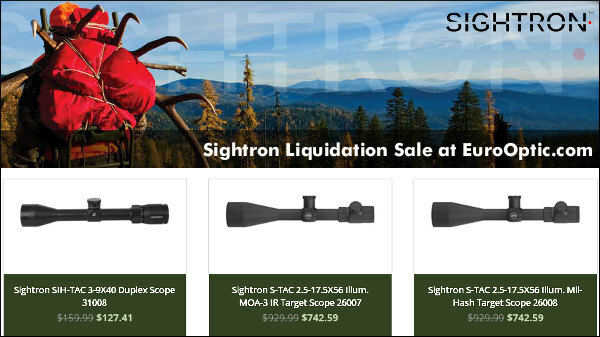 Our source at EuroOptic says: “All IN STOCK Sightrons are reduced to liquidate — these are going fast at these prices.” There are some great deals here for folks looking for medium-magnification tactical and hunting scopes. Along with riflescopes, Sightron spotting scopes are also on sale. Among pistol brass options, Starline is some of the best stuff you can buy. Strong and consistent, Starline is a good choice for stout cartridges such as the 10mm Auto, .357 Magnum, .44 Magnum, and .500 S&W. We also like Starline for our .45 ACP loads. 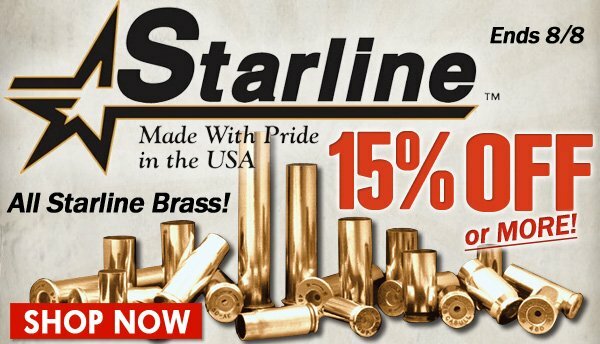 Right now you can get significant savings on Starline’s entire stock of cartridge brass (both regular and nickle-plated). Midsouth is running a 15% Off Starling Sale now through 8/8/2017. Take advantage of these 15% Off Savings before the sale ends on Tuesday, August 8, 2017 at 11:59 PM. 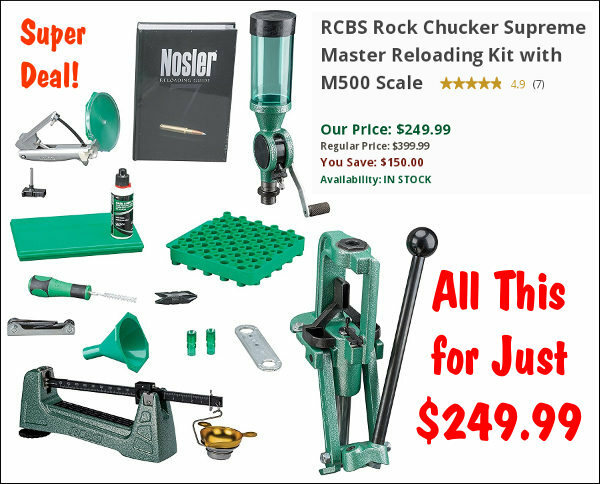 Share the post "Bargain Finder 98: AccurateShooter’s Deals of the Week"